Arrive in Beijing. Transfer to the hotel. After breakfast you will visit the Chinese Nationalities Ethnic Culture Park and Chinese Nationalities Museum celebrating ethnic cultures of China with a focus on traditional architecture, music, and dance. Continue to the primary scene for the Beijing 2008 Olympics, featuring the 'Birds Nest' Stadium, 'Water Cube' Aquatics Center, Ling Long Pagoda and the PanGu Center, on to the "World of Miniature" park, Beijing Aquarium and Zoo, one of the biggest zoos in the world. Today's city tour includes visiting the Great Chinese Wall, Tiananmen Square, National Museum of China, the House of People's Meetings, the majestic monument to the National Heroes and the mausoleum of Mao Zedong. Tour the Forbidden City and visit the Temple of Heaven in the afternoon. In Erlian you will change trains and continue your journey to Ulan Bator. Welcome to Mongolia! Upon arrival we will transfer to Terejl National Park, settle in your yurts and rest before lunch. After lunch we take excursion to the turtle rock and enjoy beautiful scenery. Hiking tour to the top of overlooking hill to have a general view of the Terelj National Park. Visit a nomadic family and get introduced to the authentic lifestyle and culture of Mongolian nomads and try traditional dairy food. Optional horseriding and building a small yurt. Dinner and overnight in the yurts. Breakfast at the camp and transfer to Ulan Bator. Ulan Bator - meaning "Red Hero" - is the capital and the largest city of Mongolia. The city was founded in 1639 as a nomadic Buddhist monastic center that has changed its name and location numerous times. Located in the northern part of the country, high above sea level, Ulan Bator is the coldest capital city in the world. A commercial hub connecting the Trans-Siberian Railway with the Chinese rail system, Ulan Bator has become a thriving urban center in one of the most remote locations in the world. New modern buildings are erected on any available patch of ground, next to retro Soviet architecture, Humvees, horse carriages and Land cruisers. They all share the pot-holed roads, and tourists and rich Mongolians look for bargains in European boutiques and cashmere stores. Next to these chaotic scenes are islands of tranquility: quiet monasteries, squares and cafes. The city will shock and excite you. The sightseeing program includes a visit to the Buddhist Monastery Gandan with its famous 26.5-meter-high golden statue of Migjid Janraisig, the Zaisan Memorial, theSükhbaatar Square, and the Palace-museum of Bogd Khan Uul, the Museum of History of Nature, the State Museum of History of Mongolia and an excursion to the Park of Buddha. Mongolian BBQ lunch. Later in the day you will enjoy a folkloric show. 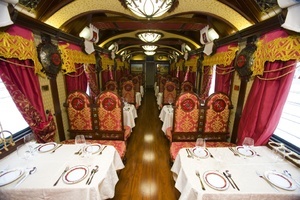 In the evening your luxury train will depart from Ulan Bator. Today's stop is Ulan Ude. It was founded by the Russian Cossacks as a winter post but received a status of the city by Catherine the Great's decree. Ulan Ude, with its unique historical and cultural heritage was included in the list of Cities of Historical Heritage of Russia. The city carried its traditions and spiritual culture thru the centuries and even the coat of arms of Ulan Ude presents "soyombua" - traditional Mongolian symbol of eternal life (the sun, the moon, and family hearth). Today you will travel by ferry to Listvyanka village located on the shores of Lake Baikal. Lake Baikal is not only the world’s largest freshwater lake, but it’s also the deepest and among the clearest of all lakes. It is the 7th largest lake in the world and is considered to be the world’s oldest lake dating back 25 million years. Over 1,700 species of plants and animals can be found in Lake Baikal with two thirds of those species being unique only to the lake and cannot be found anywhere else in the world. You will explore Lake Baikal area, have a picnic lunch and visit Chersky Stone observation point with a beautiful view of the southern part of the lake and the mouth of the Angara River, a favorite spot for tourists and photographers. You will visit Baikal museum dedicated to the flora and fauna of the Lake, local fish and souvenir market. In the evening you will continue your journey. 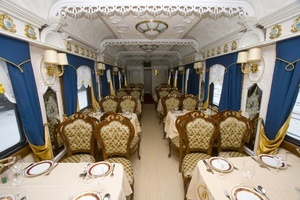 Today the train reaches Irkutsk, the capital of Eastern Siberia. Irkutsk was founded in 1661 as a fortress on the distant Russian border. Soon it became a large merchant city, gold mining and trading post with China. Before the revolution Irkutsk was often referred to as Saint-Petersburg of Siberia. During the city tour you will get acquainted with many of the well preserved historical monuments: the railway station, Church of Our Savior, Epiphany Cathedral and Church of the Transfiguration, reconstructed Alexander Nevsky Cathedral, wooden cottages and the so called "lace house", also known as the "House of Europe", theDecembrists house, beautiful streets of the city and the lively market hall. After lunch in the local restaurant, you will visit "Irkutskaya Sloboda" - a city quarter with reconstructed 19-20th century buildings and the ethnographic museum Taltsy located on the picturesque right bank of the Angara River. All day on board. 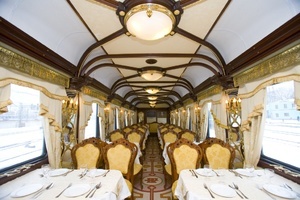 Your private train, by now your second home, proceeds onward, passing by breathtaking landscapes, over the Yenisei River through Siberia. Novosibirsk was founded in 1893 at the site of the Trans-Siberian Railway crossing of the Siberian River Ob. At that time it was named Novonikolayevsk after the reigning Tsar Nicholas II. In 1907, with a population exceeding 47,000, it was granted town status with full rights for self-government. Today Novosibirsk is a modern city with a population of 1.5 million, the third largest city in Russia, mostly known for its advanced scientific and technological center Akademgorodok. During the city tour of Novosibirsk you will visit a Railway Museum, Ballet and opera house, old town and Ob river esplanade. 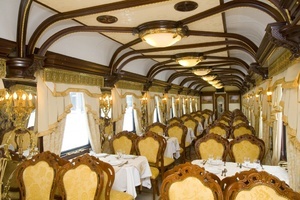 Board the train in the evening and continue your trip to Yekaterinburg and Kazan. Sightseeing tour of this unique city on the cross-roads of Russia, China and Mongolia offers a unique understanding of its heritage of world religions, as well as ethnic and cultural diversity of this area. You will visit datsan (Khambyn Khure) at Verkhnaya Berezovka, women datsan (Zungun Darzhaling), Odigitria Cathedral and the Holy Trinity Church. Reception and folklore program will follow in a traditional Buryat Yurt. Hospitable Buryats will teach youhow to cook the traditional Buryat dish pozy, how to play dice, use a bow, wear a traditional Buryat costume, and how to assemble and disassemble a felt yurt. Morning arrival in Yekaterinburg. Founded in 1723, and named after Peter the Great's wife Empress Ekaterina , Yekaterinburg was one of Russia’s first industrial cities. Today it is the fourth-largest city in Russia. It is located at the border of Europe and Asia and is mostly known for the tragic events that took place soon after the October Revolution, on July 17, 1918, when Tsar Nicholas II, his wife Alexandra, and their children Grand Duchesses Olga, Tatyana, Maria, Anastasia, and Tsarevich Alexey were murdered by the Bolsheviks at the Ipatiev House in this city. Other members of the Romanov family were killed the day after. 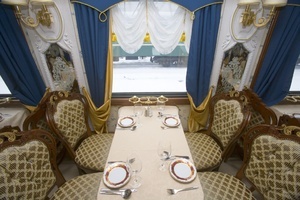 The city tour of Yekaterinburg is dedicated to the last days of the Russian Royal family. During the tour you will visit the Church on Blood erected in memory of this tragic event. Another interesting stop is the memorial built at the European-Asian Border, one of the most visited sites in the vicinity of Yekaterinburg. The border mark is on the right side of Moskovsky highway that used to be the Great Siberian Road. Hundreds of political prisoners and convicts, exiled by the Russian Tsars to Siberia, would pass this place in shackles every day down the same road. Think about it when you travel by Trans-Siberian from Yekaterinburg to Moscow. That's only half the way the others had to walk! The border mark was erected in 2004 and represents intertwined letters "A" and "E". You can literally have one foot in Europe and another in Asia at this spot. Arrive in Kazan in the morning. After breakfast, city tour of Kazan, the capital and the largest city of the Republic of Tatarstan, located on the picturesque banks of the Volga River. Muslims and Christians live side-by-side in peace in this colorful and diverse city. The central part of Kazan is on the UNESCO World Heritage List. The Kazan Kremlin is the main historic site of the city built at the behest of Ivan the Terrible. It is the home of many old buildings including The Annunciation Cathedral, dating back to the 16th century, the leaning Soyembika Tower, the Church of the Exaltation of the Holy Cross, Peter and Paul Cathedral, the Spasskaya Tower, and the recently built Qol Sharif mosque. In the afternoon, enjoy a lunch including a master class by Tatar chef revealing the secrets of Tatar Cuisine and a folklore program, "Tugan Avalim". In the evening the train departs for your next stop. Arrive in Moscow. After breakfast, all day sightseeing tour of Moscow, walking tour of Arbat, Moscow Metro and Church of Christ the Savior. Board the train in the evening. End of trip. Transfer to the hotel. • Services of the porter at the hotel and the railway station. 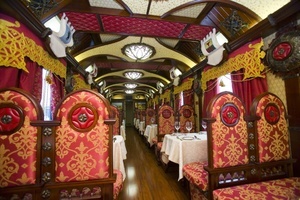 • Onboard the “Imperial Russia Train” in Russia and Mongolia, Chinese train – in China. • 1 night at Moscow hotel (Tour Moscow-Beijing). Baltchug Kempinski or Marriott Tverskaya Grand. Excursions for groups up to 10 people will be conducted in English. When forming a group of more than 10 people excursions in German, French, Italian, Spanish and Portuguese languages are possible upon request. 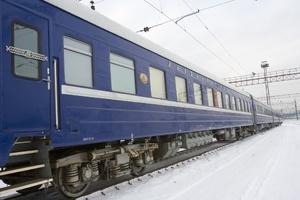 Specific travel arrangements and train departure times depend on schedules of Russian, Mongolian and Chinese Railways and may be subject to change. Our travel specialist will review your program and issue a final booking confirmation 30 days prior to departure.